Arte Viva is an innovative company committed to making kindergartens and schools safe and care-free environments. To that end, they have designed an inexpensive line of quality products to protect hands, fingers and bodies from potentially dangerous areas around doors, corners, windows and floors. In many parts of Europe, door finger guards are now mandatory in childcare facilities. As a result, door related injuries are down 40%. The company’s products deliver quality results where it matters most. Arte Viva finger guards are made for doors of all types and materials. 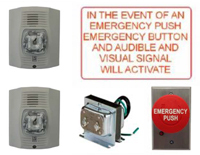 Use the Finger Alert 110º for standard doors that open up 110º. The Finger Alert Professional 170-180º has been tested in use on over 250,000 door types and is suitable for standard, swing, or pivot doors. The Finger Alert Professional Extreme is for doors with a maximum opening of 180º. Use Fingers guards on doors made of steel, wood, PVC or aluminum. These hand and finger pinch guards come with a wide and narrow strip for the outer and inner angles of a door joint, are available in three lengths and the professional products come in white, grey and brown colours. Another line of products that address potentially dangerous corners is the Arte Viva Corner Guard or corner protector. These products come in standard, multi-coloured deluxe, pencil shaped and industrial varieties. Wall corner protectors prevent injury caused by impacts into the sharp corners. The various plastic standard, decorative and industrial styles guarantee that customers will find the appropriate wall guard for whatever environment they are securing. The company has also created additional innovative products to protect against other potentially hazardous zones. Their Finger Alert Door Stopper and Blocker are artful doorstops that prevent the slamming of doors and enable them to be easily fixed open. The Window Alert is a window safety lock for children that stops windows from being completely opened. The Safe Coat Hook is a coat hook for kids that stimulates children to hang their coats while eliminating potential injuries from bumps or scrapes. Problematic slippery floor areas can be managed with Anti-Slip Stickers with a non-slip surface. The company is on YouTube with product videos for many of their products, such as this one highlighting Finger Alert door safety strips and Corner Guards. To see all of the Arte Viva videos, visit their YouTube Channel.